It is a combination of tread and riser which permits ascent and descent from one floor to another. The upper horizontal portion of the step over which foot is placed during ascending or descending a stairway is known as tread. The vertical member of the step is known as riser. It is used to support and connect the successive treads. The vertical height between two consecutive treads is known as rise. A horizontal platform between two successive flight of a stair is called landing. Landing is used as a resting place during use of the stair. It facilitates the change of direction of the flight. Landing which extends for full width of the staircase is known as half-space landing. Landing extending for only half the width of staircase is known as quarter space landing. It is the projecting part of the tread beyond the face of the riser. Nosing is usually rounded to give good aesthetic effect to the treads and make staircase convenient and easy to use. The horizontal distance between without the faces of two consecutive risers is known as going of steps. A continuous series of steps without any break between landings or landing and flooring is known as flight. The vertical height between the tread of one flight and the ceiling of the overhead construction is known as head room. Head room should be sufficient so as not to cause any difficulty to the persons using the stair. Head room is also known as head way. It is an inclined rail provided at convenient height over balustrades. The inclination of the rail is parallel to the slope of the stair. It serves as a guard rail and provides assistance to the users of the stair. hand rails can be molded in so many architectural forms. It also acts as a protective bar. It is an individual vertical member made of timber, metal, or masonry and fixed between string and hand rail to provide support to the hand rail. Framework made from series of balusters and hand rail is known as balustrade. It is also known as barrister. Vertical angle made by nosing line of the stair with the horizontal is known as pitch or slope of the stair. 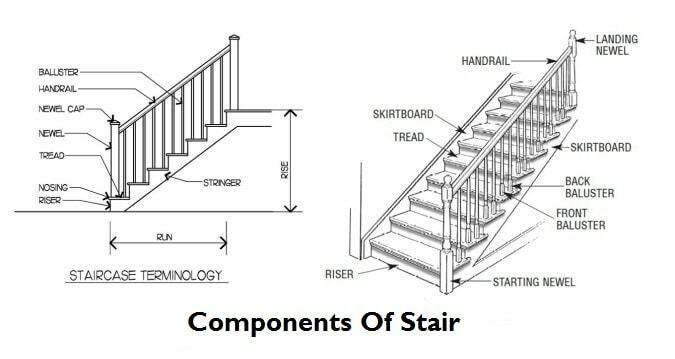 The total length of the stair in horizontal plane including lengths of landings is known as run of the stair. The undersurface of the stair is known as soffit. It is either finished with plaster or covered with a ceiling. It is a sort of additional moulding provided under the nosing or tread to beautify the step of elevation. It is a vertical timber or steel post provided at the head, foot or at point where the balustrade changes its direction. It is also used for supporting the hand rail. These are the sloping wooden members of a stair, used to support the end of the steps. Stringers may be two types, Cut or open type and closed or housed type. In case of former type, the upper edge is cut exactly to sie to receive the ends of steps. In latter type i.e closed or housed type, the ends of steps are housed into the stringers. The thickness of the RCC slab over which steps of RCC rest, is known as waist. It is an imaginary sloping line parallel to the slope of the stair and touching the nosing of all the treads. It is the approximate line on the stair, adopted by the people during use of the stair. This line is located about 40 cm from the centre of the hand rail. It is triangular framing under the outside string of an open string stair. Also Read – Components Of Bridge. Also Read – Types Of Footings Used In Building Construction.